Went into work a few hours before class today so that I could hang work for the annual Student Art Exhibition at my community college. I put together a small selection of work representing all 3 classes I taught last semester. Some of this work was pulled from student portfolios abandoned in the classroom since last fall, some I arranged to be dropped off over the last week by e-mail, and some was brought in tonight by students in my Figure class who I also had last fall. Printmaking isn't taught there, so there isn't much printmaking in the show. (Lots of digital art on display, but I don't count that.) But you know that I'm going to expose my students to printmaking, and since I do have print projects in a few of my classes, there are prints in my contribution to the show- a monotype from my Basic Drawing class, and 3 woodcuts (with one more to come in a few days) from my 2D class. Now all the students who see the show get exposed to a little printmaking and that's a good thing in my view. 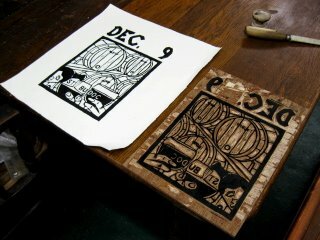 With St Budoc now finished, it's time to think about what the next print will be. Right now it's pretty wide open. Sometimes I'll have new prints that are a priority- a group folio, a commission, a piece for a theme show, or something I want to debut in a solo show. None of those conditions exist right at this moment. There is one project that particularly interests me right now, a portrait/figure piece, but the person I have in mind as the model has asked for another week to decide whether or not she wants to participate. I have enough in life to keep me busy that I'll likely just wait that week before worrying about any other prints. If the figure project doesn't happen or is postponed a significant length of time, I have a couple of options. I can always extend one of my ongoing series, such as the saints, supermarkets, or bowling alleys. I've got ideas for all these, some going back years, and they can be pulled out and started any time. Or I can try to develop a new work or series. I have a few thoughts that I think have potential, but none are anywhere close to starting yet. Sometimes these things are only figured out gradually over time, but sometimes sitting down with a sketchbook and putting something on paper is enough to get things moving. In about a week, you'll know which directions I'm leaning. Early in the afternoon I drove up to the studio, carrying the colored proof from yesterday. After looking at it much of last night, I decided that I liked the colors I ended up with, so today it was just a matter of going to them directly and being just a little more careful with the brush. 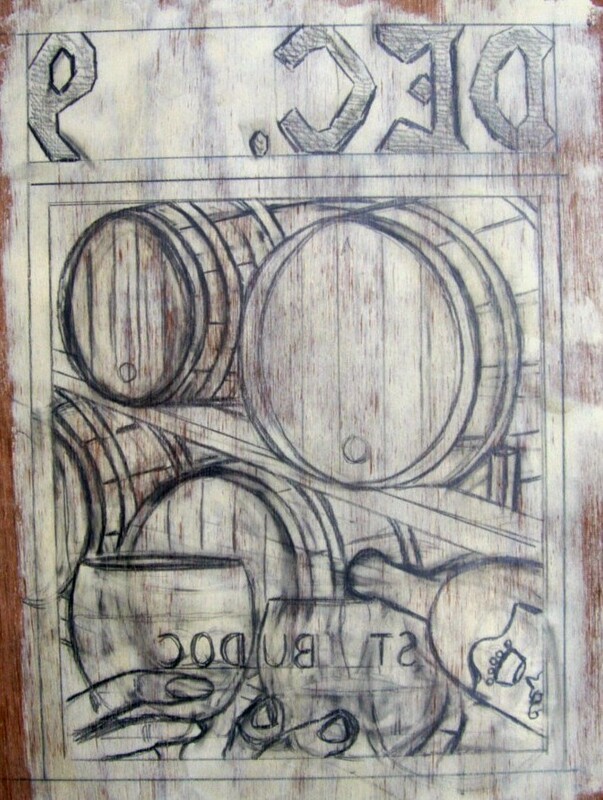 Same as yesterday, tape it down, then wood and flesh tones first, grays second, wine bottle and wine last. Whole thing took about 90 minutes, including layering multiple washes in some areas. I'm generally pleased and happy to have this print as part of the Everyman series. Now I just have to find out if the newlyweds also like it. Once the tape had mostly dried I started coloring. From my traditional watercolor training I have the habit of starting with lighter warmer colors first, especially when there are a lot of similar colors. That's what I did today, using lots of golden brown tones for all the wood (barrels, rack) and the skin tones, as is seen in the photo above. 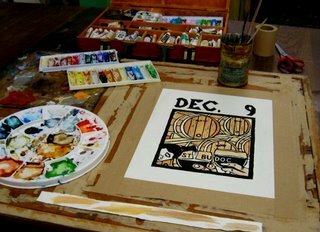 After letting that dry a little I came back in with some of the grays (hoops, floor), added some shading to the barrels (umber, indigo), and colored the wine bottle label. 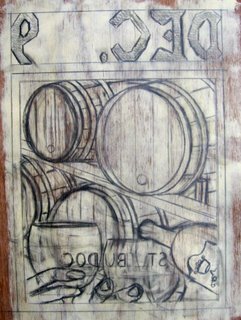 The photo shows that I had originally put a light wash of the wood color where the wine glasses are, since the wood color would be naturally seen through the glass. I didn't like the results- they didn't read as glasses and the wood color was overwhelming the composition. So I overlaid it with layers of a cool white tinted blue, which makes the subject more obvious and echoes the cool grays in the barrel hoops. Last I added the darkest color- the red wine pouring from the bottle and in the glasses. I like the results so far, but I took it home so I could look at it for a while. Tomorrow I'll color the second proof, either copying exactly what I did today, or with some minor changes if I feel different after living with it a while. Either way, I'll post the finished print. Wednesday was the first meeting of my figure class, a very full house. On Thursday I finished updating my gallery resume, put together that proposal packet and got it in the mail to Georgian Court. E-mailed my contact there to let her know to expect it. In the evening I had my first meeting of my fourth class, a 2D Design. Learned that the class will be moved across campus starting next week. The new room is an upgrade, so this is not a bad thing. Spoke to some students I had last fall about bringing in work next week for the annual student art show. Friday was the first real day of winter around here, the coldest day in 2 years. I had a decent turnout for class anyway as my 2D class worked on exercises related to line and negative space. Not working today, so I put the time to use taking care of some art business. Last fall I was in touch with people in the art department at Georgian Court University in nearby Lakewood (home of the BlueClaws) regarding the possibility of having another solo show in their gallery. I had one there in 1999 that was well received, and I've done enough new work since then to put together a completely new exhibition. But with the end of the semester coming fast and the holidays right behind that I didn't have time to put together a proper packet, and I figured the faculty there would be in the same position and not have time to evaluate it. So I told the gallery coordinator that I'd send it at the beginning of the next semester, and that's here now. The first step was putting together a page of slides. I wanted a representative set of post 1999 work. I found 4 slides each from my various series related to saints, supermarkets, and Ecclesiastes, and 8 more of various unrelated works. Some needed new labels, quickly produced on the computer. Then a cover letter and an artist statement were typed. Still need to update the resume and address the mailing and return envelopes, but by this time it was late in the evening, so those items can wait until tomorrow. My second day of class and the second time I had to clear snow off the truck before driving to school. After class I stopped to pick up some new plywood before getting to the Parkway, then drove back down to Monmouth County, eventually ending up at the studio. Molly was there using a sander to touch up her latest table piece. Meanwhile I set up to print and pulled a few proofs of the new St Budoc block. I hung one up and took one home to look at over the next few days as they dry. I still need to color them after they dry, but with my class schedule that may have to wait until the weekend. 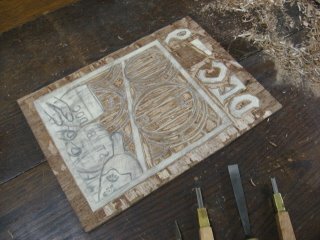 I found a few minutes to get into the studio and finished the cutting of the St Budoc block. I had been concerned when I started this one because the wood I used is an old scrap, I suspect maybe a piece I brought back from Carbondale, so I feared it might be a bit dry and splintery despite my usual resurfacing treatment. But I sharpened the tools before beginning and the wood held up pretty well. Just a few minor repairs needed along the way. Took a rubbing with newsprint and it looks about what I was expecting. I wanted to get back home to see some football and get started on my Sunday cooking, so I decided to put off proofing it until tomorrow or the next day. I stopped by the Boathouse in Belmar around noon to drop off a piece for the upcoming Belmar Arts Council's "First Members' Salon of Art". The building renovations are coming along to the point where we are ready to show it off, and since empty walls are not that exciting, members were invited to bring one piece each to display. I brought in an older work, Moving Day, which is just back from another show and not needed anywhere else anytime soon. The plan is to have a discussion of all the work at the next members meeting Tuesday Feb 6 at 7:30 pm. 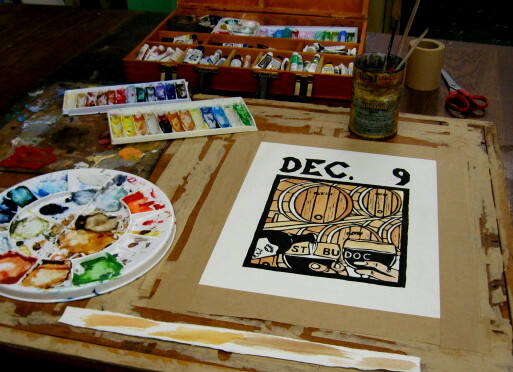 It will also be open to the public during the Belmar Art Walk coming up Feb 18. As for the image, you can see it on the home page of my web site. My help wasn't needed to hang the show, so from there I continued north to the studio and began cutting the St Budoc block. As you can see above, I made some good progress in a few hours. I always start by cutting around the margin, then with these saint images, I do the date next. As for the rest, I finished up almost all the barrel parts, leaving just the hands and glasses for next time. The light snow overnight into this morning didn't cause too many road problems, so school was open and my first class of the semester met as planned. Even had all the registered students show up. When I got home in the afternoon I found e-mail from my friend the bride waiting for me. She thinks the St Budoc print looks great so far and seems excited by the whole project. I'm going to try to get up to the studio tomorrow and begin cutting the block. Spent most of the day working on stuff related to the beginning of the fall semester. At this point it seems I'm teaching 4 classes, two at each of my colleges. Going to one of them for an all day colloquium tomorrow, so it's a good day to drop off all my handouts for copying. The one thing I did toward my art today was pick up a new digital camera that I had on order. Not for making art as much as documenting it. I'm more used to using 35mm slides, but two recent exhibitions I applied for would only accept digital submissions on disc, so I figure maybe it's time to start the transition. (Borrowed my parents' camera for those, but that's not always convenient.) Besides, I'm going to need a digital camera to provide all those scenes from the studio for this blog. Tonight I got as far as taking it out of the box, putting in the batteries and new memory card, and taking some snapshots of my living room. I'll figure out the rest after I get past the next few days of school. So here's where we get started with the new art. I'm working on the latest print in my Everyman series, which is based on my reading of Butler's Lives of the Saints. I started this series back in 1994 and I've done somewhere around 75 of them so far. The dates at the top are the saint's feast day, which is how they were organized in the book. It's also a common selling point, and if you're looking for a particular day, right now there's about a 1 in 5 chance I've done one. This one is a date I didn't have, but is the wedding day of a friend. 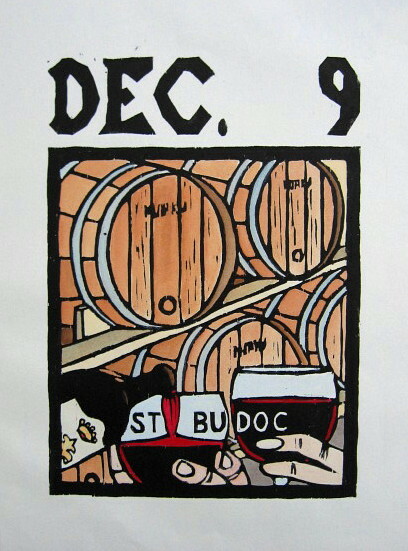 She liked the idea of getting some art as a wedding present and so I suggested a saint for December 9. Of the options I gave her, she liked best the story of St Budoc, which includes a legend that claims he was born in a wine barrel floating in the sea. What I'm showing here is a version of the drawing on the block, which I e-mailed to the bride yesterday. Haven't heard back from her yet, but I did spend a little time in the studio today after work, reworking some of the barrels. Have a lot of class preparation to do this week, so I probably won't start the cutting until the weekend. Studio Arrabbiata is named for an Italian word translated as "rabid" or "fighting mad". In cooking it refers to a spicy tomato sauce that gets its bold taste from just a few ingredients and simple preparation. 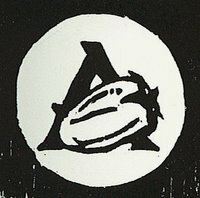 The Arrabbiata movement believes in the power of woodblock prints to achieve maximum impact with nothing more than a piece of wood and a sharp knife. This is art that believes what is on the paper is far more important than any abstract theory. Response to this art may be positive or negative, but it will not be ignored.